After Jeju Island’s bus system restructuring, the number of people on Jeju who are using public transportation has increased. The Jeju Government announced on Dec. 12 that the bus system restructuring, which took place on Aug. 26, has started to stabilize. According to the analysis of October's data for public transportation, 166,000 people used public transport on Jeju per day. This was an increase of 9.4 percent when compared to the same period last year. The number of passengers who use public transport at the weekend increased by 17.2 percent. The number of people who used transportation cards increased from Aug 26. to Oct 31. Also, compared to the previous year, transportation card usage increased by 27% to 8.6 Million users. The most used bus route is the Bus No.365-1 which travels from Jeju University ~ Jungang-ro ~ Yongdam ~ Halla Hospital ~ Halla University. This route has an average of 11,000 passengers a day. 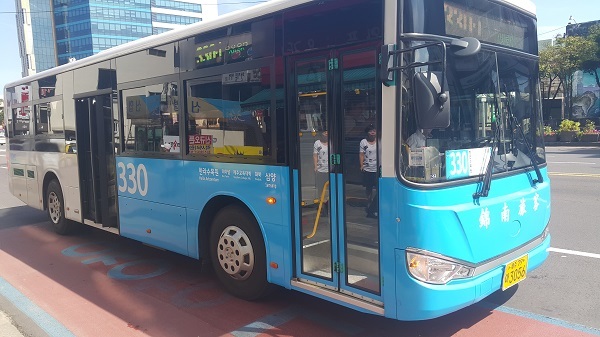 The next most used route is bus No.360 which travels from Jeju University ~ Jeju City Hall ~ Bus Terminal ~ Jeju Provincial Office ~ Halla Hospital ~ Jeju High School. An average of 7,600 passengers a day use this route. According to customer satisfaction surveys, before the reform took place, 23.4 percent of bus users were satisfied and 44.2 percent were dissatisfied. However, since the reform 52.1 percent are satisfied and 33.6 percent are dissatisfied. The city continues to monitor any issues with the transport system. They plan to add additional buses to routes that are popular and make adjustments to any buses that are unpopular.